This is not the first time we have received hints that Apple is working on an innovative universal remote control for controlling TV and video content. In January, we told you that Apple was researching a touchscreen remote with adaptable user interfaces. The invention would essentially allow button layouts stored in the cloud or in a device (such as a TV) to be wirelessly and seamlessly beamed to the controller’s UI. The concept would alleviate the “table full of remotes” scenario Steve Jobs described at D8. One of Apple’s wild new universal remote features works like this: you take a photo of your current TV remote and it sends it to iCloud for analysis. It then sends a “virtual copy” of your remote, functionality and all, to your iPhone. You’re now able to control your current TV with Apple’s advanced universal remote and enjoy all of Apple’s TV remote features and likely tie-in products and services. 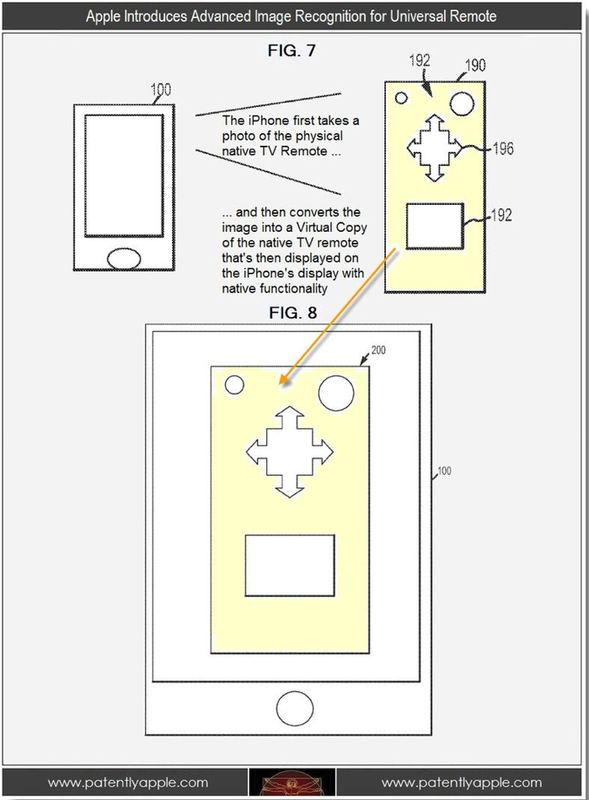 Apple’s remote–which the patent mentions could be integrated into an iOS device with IR capabilities—could include one or more cameras, microphones, and sensors capable of detecting changes in volume, indicator lights on devices, etc. These could decide the current state of a device, allowing the remote’s functionality to adapt, for example, to what is onscreen at any given moment. the image may be processed to determine shapes and/or characters on a television screen. The shapes and characters may be used to determine that the television is displaying content from a particular source. If you think of it, that translates in-part to reading logos on screen from sources such as ABC, NBC or HBO for instance… a television having a particular aspect ratio may be recognized based on it proportions and/or its size relative to other objects. A brand name or logo may be recognized for a particular DVD player, or DVR (e.g., TiVo). Moreover, a shape and/or particular arrangement of a face of a device may be recognized (e.g., a Nintendo Wii video game console). Of course, with Apple continuing its hobby set-top box project with a recently refreshed Apple TV, and rumors of an Apple-branded HDTV, it is possible Jobs’ vision of finally cracking television and users no longer having to “fiddle with complex remotes” also included a revolutionary remote control.